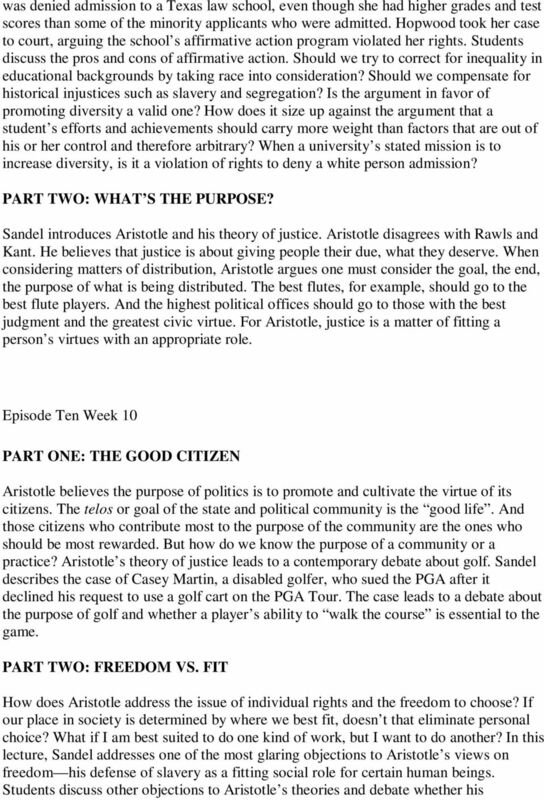 Download "Justice: What is the Right Thing to Do? Nan Norling, Parry Norling, Pete Wellington, Jack Schmutz Spring 2010"
4 enforce tax laws passed by the representatives of a mere majority? Doesn t that amount to taking some people s property without their consent? 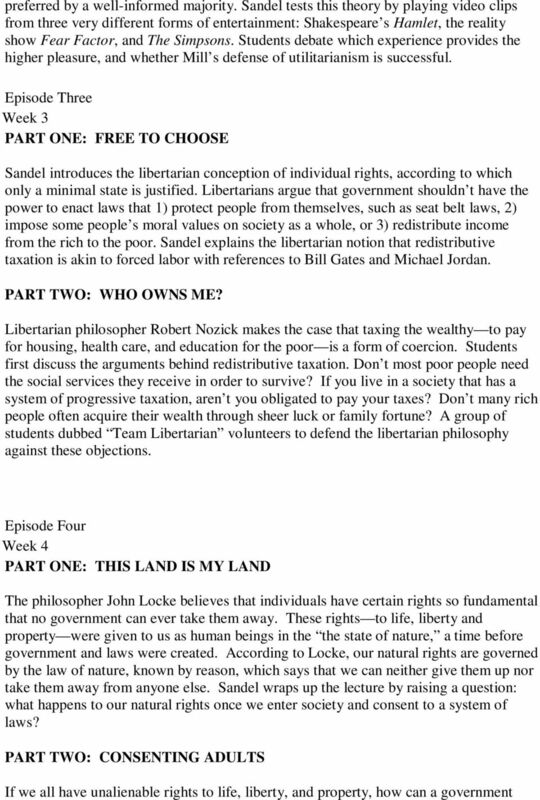 Locke s response is that we give our tacit consent to obey the tax laws passed by a majority when we choose to live in a society. Therefore, taxation is legitimate and compatible with individual rights, as long as it applies to everyone and does not arbitrarily single anyone out. Episode Five Week 5 PART ONE: HIRED GUNS During the Civil War, men drafted into war had the option of hiring substitutes to fight in their place. 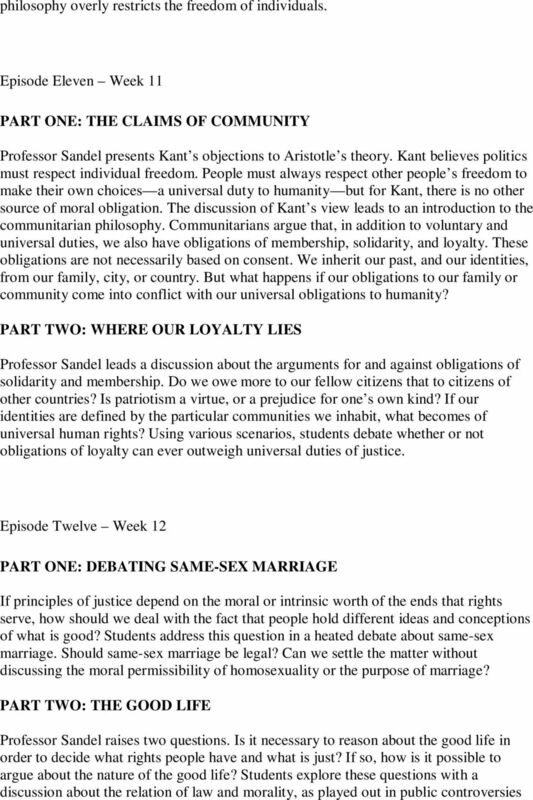 Professor Sandel asks students whether they consider this policy just. Many do not, arguing that it is unfair to allow the affluent to avoid serving and risking their lives by paying less privileged citizens to fight in their place. This leads to a classroom debate about war and conscription. Is today s voluntary army open to the same objection? Should military service be allocated by the labor market or by conscription? What role should patriotism play, and what are the obligations of citizenship? Is there a civic duty to serve one s country? And are utilitarians and libertarians able to account for this duty? 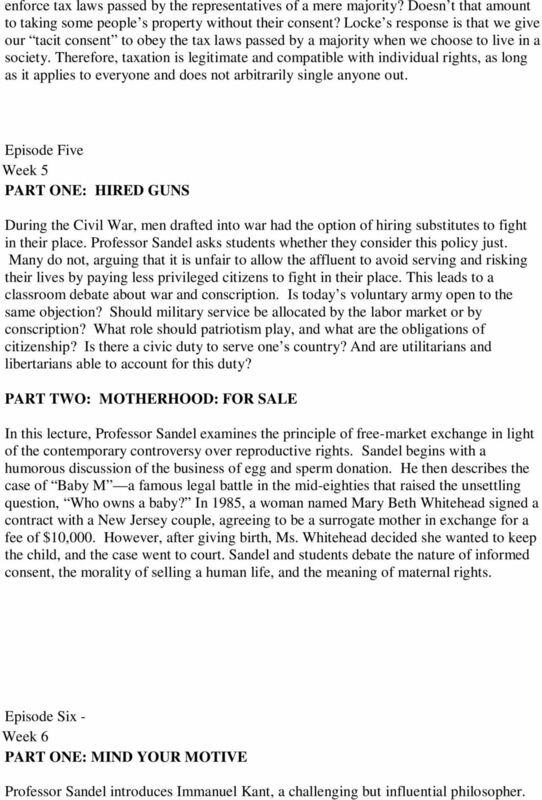 PART TWO: MOTHERHOOD: FOR SALE In this lecture, Professor Sandel examines the principle of free-market exchange in light of the contemporary controversy over reproductive rights. 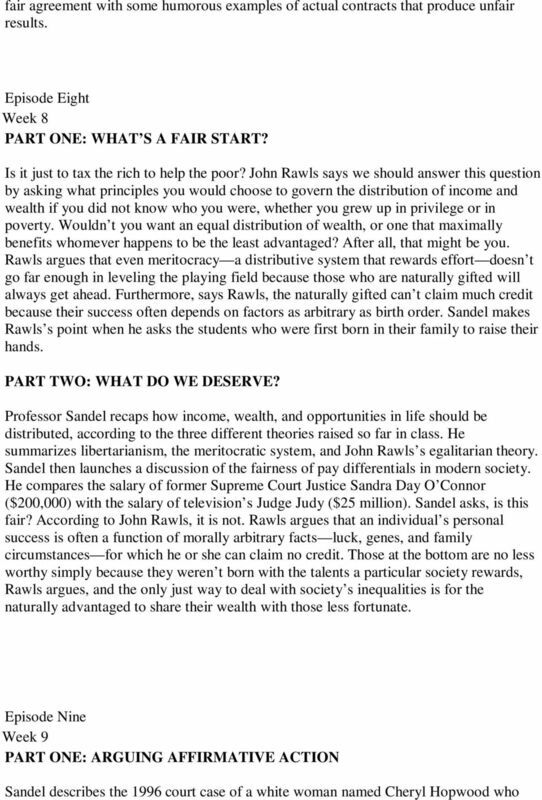 Sandel begins with a humorous discussion of the business of egg and sperm donation. He then describes the case of Baby M a famous legal battle in the mid-eighties that raised the unsettling question, Who owns a baby? In 1985, a woman named Mary Beth Whitehead signed a contract with a New Jersey couple, agreeing to be a surrogate mother in exchange for a fee of $10,000. However, after giving birth, Ms. Whitehead decided she wanted to keep the child, and the case went to court. 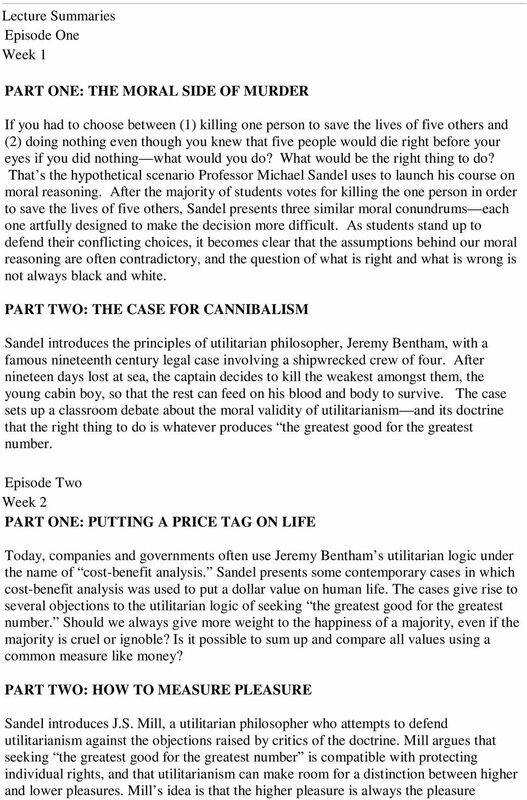 Sandel and students debate the nature of informed consent, the morality of selling a human life, and the meaning of maternal rights. 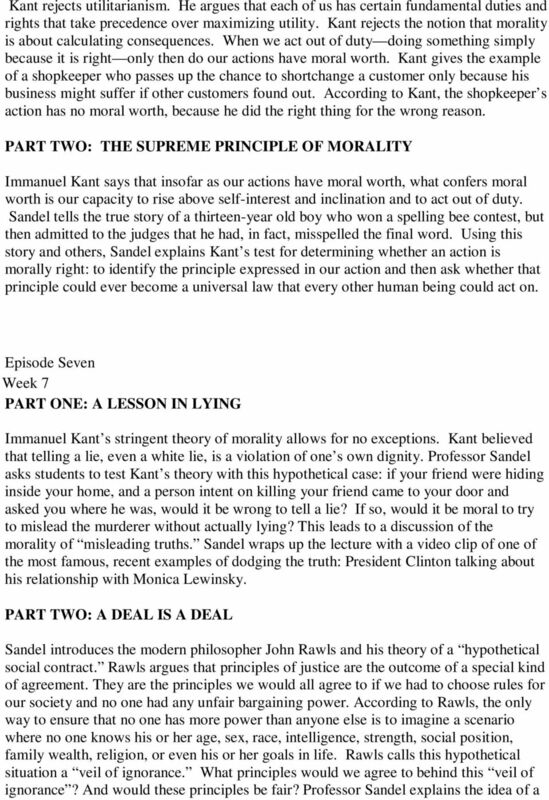 Episode Six - Week 6 PART ONE: MIND YOUR MOTIVE Professor Sandel introduces Immanuel Kant, a challenging but influential philosopher. 1 of 18 Contents What is this guidance about? 3 How has this guidance changed? 3 A. About the Equality Act 2010 (the Act) 3 A1. What is the overall effect of the Act? 3 A2. What are protected characteristics? When you leave here today, you will search for work in an economy that is still emerging from the worst crisis since the Great Depression. Do you have difficulty making purchasing decisions? Have you ever wished you could figure out how to decide more easily? The Principle of Federalism: How Has The Commerce Clause Mattered?